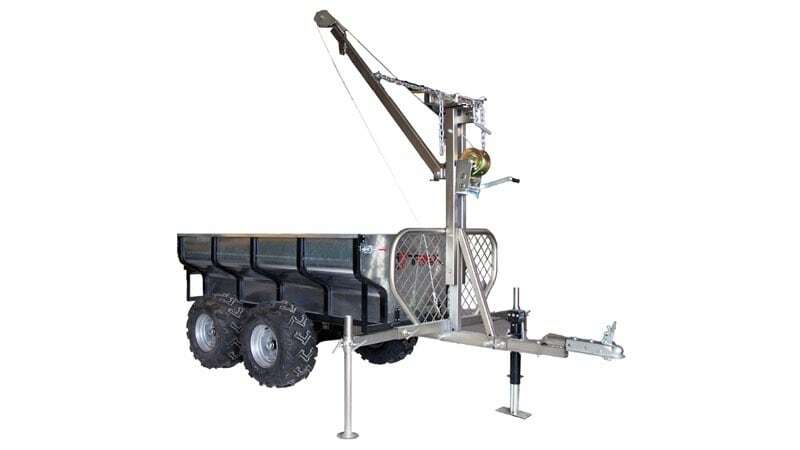 Woodland Mills is proud to offer the T-Rex utility trailer. 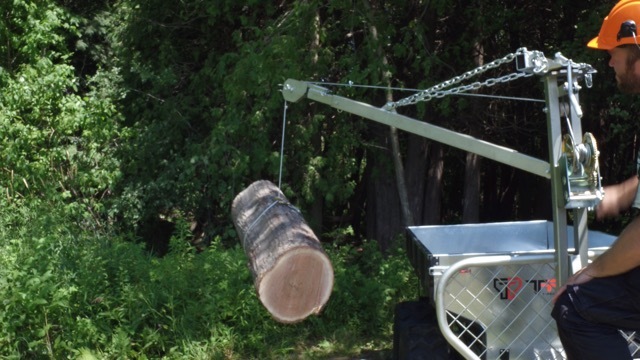 It was designed as a heavy duty and highly versatile trailer for acreage owners to aid in maintaining their woodlots and properties. 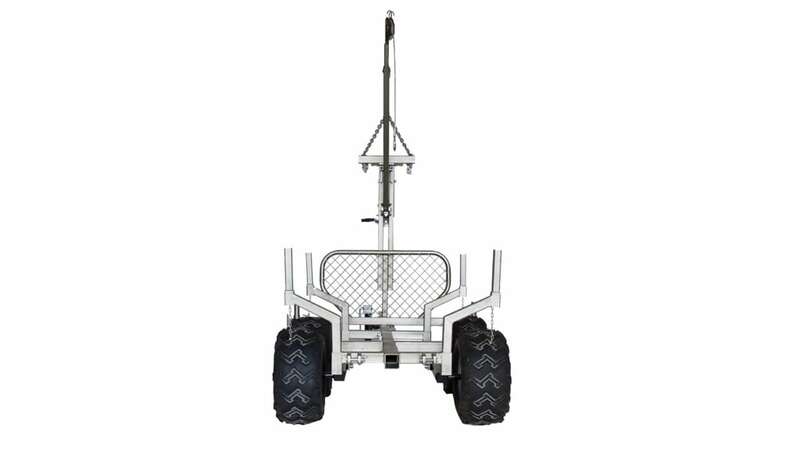 Intended to be towed behind your ATV, UTV or tractor, it will haul dirt, rocks, firewood, logs and more. 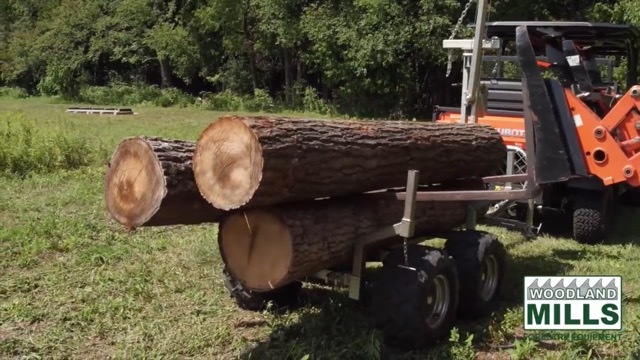 It easily converts from a dump box trailer to a log hauling trailer. 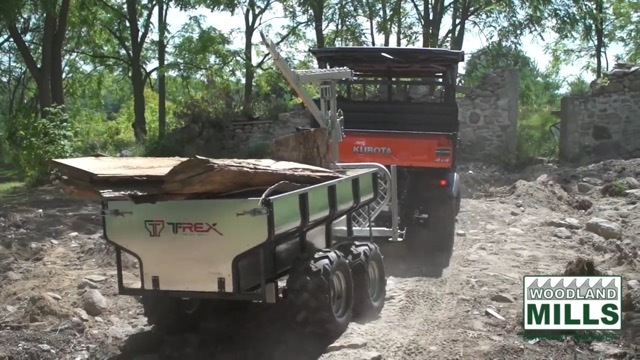 The T-Rex makes the perfect addition for property owners and sawyers. The T-Rex is backed by a full 2 year warranty against any manufacturing defects. Should you ever have any issues, just call our toll free number for tech support. 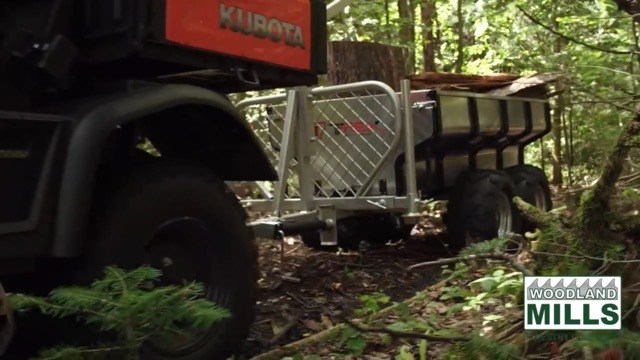 The T-Rex trailer easily converts from a dump box style trailer to a logging trailer. Simply remove the two hinge pins and slide the box off. 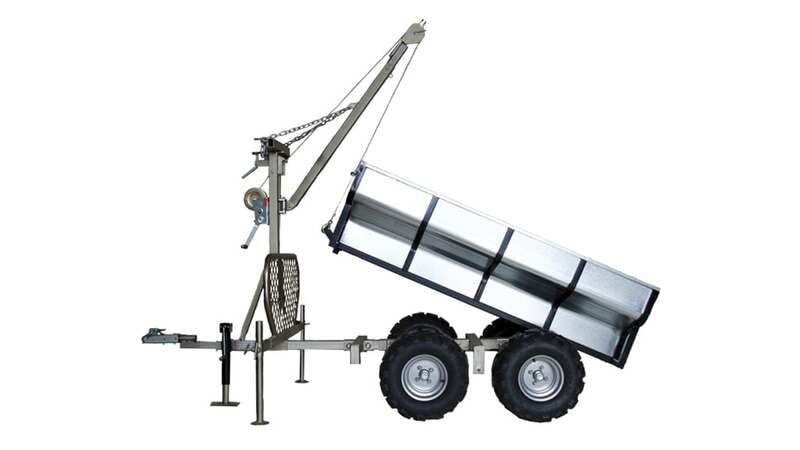 Four extension arms can be installed to increase the carrying capacity in the height dimension. 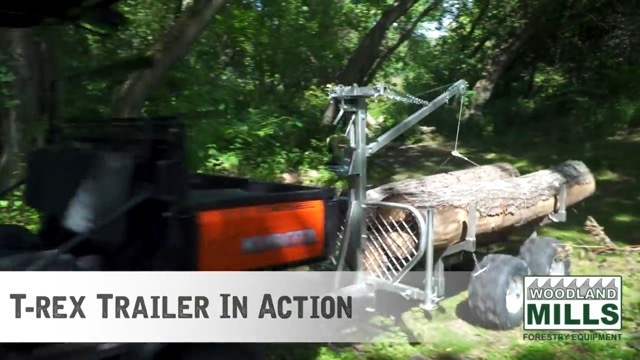 The length of the trailer is also adjustable making it possible to safely haul lumber or logs up to 12’ (3.6m) long! 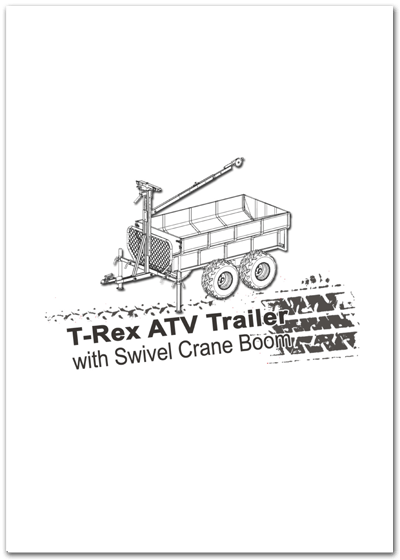 The T-Rex box liner can easily be tilted up to 60 degrees to empty any load. Simply attach the winch cable to the hook on the outside of the box liner and start winding! The T-Rex frame is made of heavy duty 0.15" (4mm) thick square tube and seam welded. The entire chassis is then galvanized to protect from corrosion. 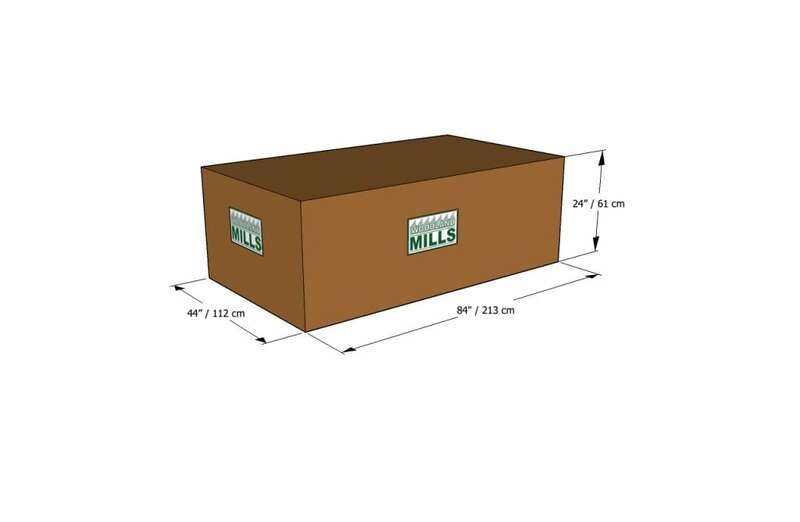 Our box liner is made from 18 gauge (1.25mm) galvanized steel and features removable tailgates at both the front and rear of the box. The boom lift is capable of lifting up to 440 lbs (200kgs) and has a rotation sweep of 90 degrees (45 degrees per side). 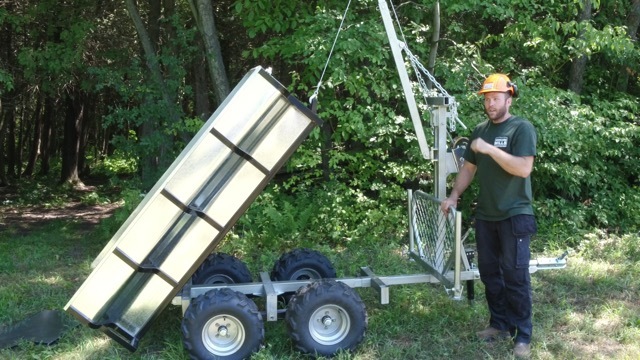 The boom is telescopic and can be adjusted to four different lengths. 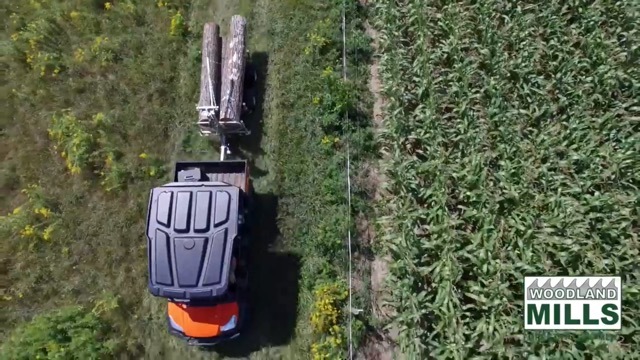 The trailer features telescopic side stabilizer arms that secure the trailer when loading or unloading objects with the boom lift. The width of the arms is adjustable and is locked in place with the threaded locking handles. 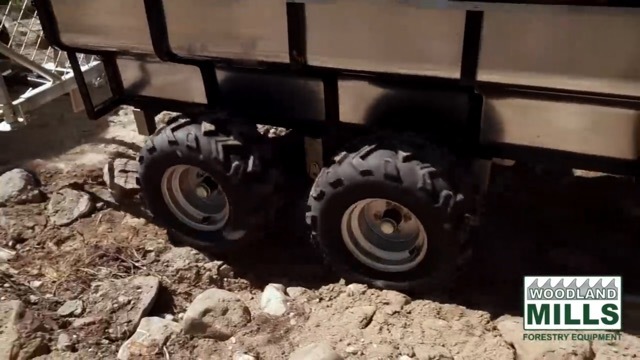 The chassis is made with 0.15" (4mm) thick square steel tubing and has a galvanized coating to protect against nature’s elements. 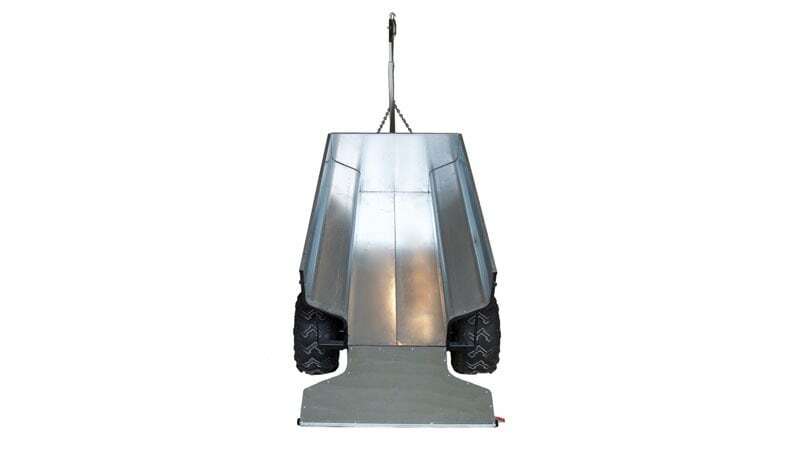 The dump box is also galvanized and is mounted to it’s own powder coated reinforcement structure for added rigidity. 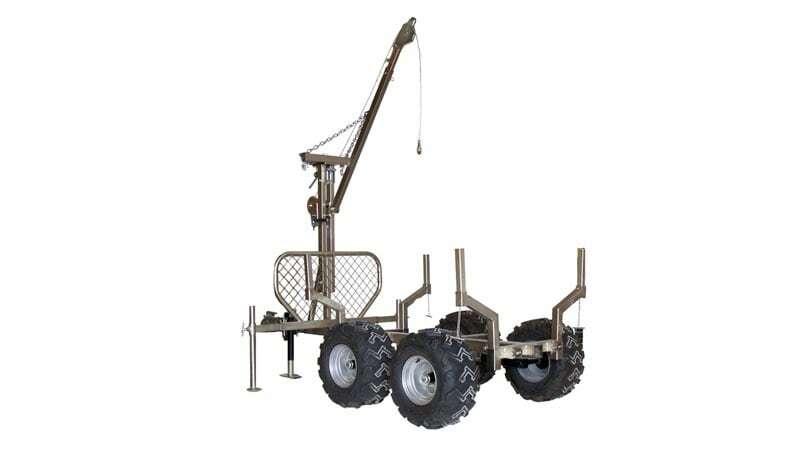 The complete chassis system connects to a heavy duty tandem axle system featuring 4-bolt hub bearings where the four 22×11-10 offroad ATV tires are mounted. The tandem axle utilizes one pivoting pin that comes standard with a grease-able zerk fitting.